As a class of famous carbon materials, biochars (BCs) and their derivative materials with excellent physicochemical properties and diversified functionalities present great potential in wastewater treatment fields. This review focuses on the latest development in reported biochar-based materials as superior adsorbents or catalysts for removing harmful organic contaminants from wastewater. The construction and properties of biochar-based materials are briefly introduced at the beginning. As one of the major factors affecting the properties of BCs, the wide diversity of feedstocks, such as agricultural and forest residues, industrial by-products as well as municipal wastes, endows BCs different chemical compositions and structures. Woody and herbaceous BCs usually have higher carbon contents, larger surface areas and strong aromaticity, which is in favor of the organic contaminant removal. Driven by the desire of more cost-effective materials, several types of biochar-based hybrid materials, such as magnetic BC composites (MBC), nanometal/nanometallic oxides/hydroxide BC composites and layered nanomaterial-coated BCs, as well as physically/chemically activated BCs, have also been developed. With the help of foreign materials, these types of hybrid BCs have excellent capacities to remove a wide range of organic contaminants, including organic dyestuff, phenols and chemical intermediates, as well as pharmaceutically active compounds, from aquatic solutions. Depending on the different types of biochar-based materials, organic contaminants can be removed by different mechanisms, such as physical adsorption, electrostatic interaction, π–π interaction and Fenton process, as well as photocatalytic degradation. In summary, the low cost, tunable surface chemistry and excellent physical–chemical properties of BCs allow it to be a potential material in organic contaminant removal. The combination of BCs with foreign materials endows BCs more functionalities and broader development opportunities. Considering the urgent demand of practical wastewater treatment, we hope more researches will focus on the applications and commercialization of biochar-based materials. The online version of this article ( https://doi.org/10.1007/s42773-019-00006-5) contains supplementary material, which is available to authorized users. Along with the fast growth of industrial technologies and economics, the quality of our life has improved out of all recognition. However, the subsequent problems about the environmental and natural resources also get worse (Brillas and Martinez-Huitle 2015; Li et al. 2018a). Taking the water system as an example, the globally available water holds a mere 0.14% of total water resource, but the water demand is increasing at a rate of about 1% per year with the ever-growing populations and economics (Chen et al. 2015). According to the reports from the United Nations World Water Development, around 80% of all industrial and municipal wastewater are released to nature without any prior treatment, leading to the deterioration of water quality directly or indirectly (Chen et al. 2015; Water 2018). Moreover, most of these wastes, particularly from the illegal industrial activities, contain some quantity of toxic metal ions, organic molecules, dyes and other cancer-causing chemicals (Li et al. 2018a; Yu et al. 2017). In order to address the urgent situation of water shortage and water pollution, numerous efforts are put to the development of highly effective technologies and materials (Li et al. 2018a; Yu et al. 2017; Zhang et al. 2019; Wang et al. 2016a; Gu et al. 2018). A number of efficient materials (e.g., clay minerals, carbon materials, natural/man-made nanomaterials) and technologies (e.g., adsorption, catalytic degradation, filtration) have been employed to remove the contaminants from wastewater (Wu et al. 2018; Chen et al. 2018a; Wang et al. 2018a; El-Qanni et al. 2016; Xu et al. 2016; Gu et al. 2019). Nonetheless, there are still some demerits in the process of water purification (Alsbaiee et al. 2016; Yao et al. 2015; Inyang et al. 2016). For instance, Cano et al. (2017) developed a novel type of palladium nanocube/multiwalled carbon nanotube (MWCNTs/Pd) composite as catalyst to remove organic dye contaminant (methyl orange, MO) from aqueous solution recently. This MWCNTs/Pd composite presented good catalytic activity (> 99%) within 60 min. But the fabrication of MWCNTs/Pd composite is expensive and complicated. At the same year, Ci and co-workers reported a novel three-dimensional agar/graphene oxide composite aerogel with maximum adsorption capacity of 578 mg/g toward methylene blue (MB) (Chen et al. 2017). However, the synthesis of composite aerogel is related to hazardous chemicals (e.g., KMnO4, H2SO4) and high cost. Driven by the intense desire of lower cost, higher efficiency and facile procedure, biochar-based technology draws great attention of a growing number of researchers in the area of wastewater treatment. Biochar (BC) is a kind of carbon-rich pyrogenic materials (Cha et al. 2016; Lehmann and Joseph 2015). This type of carbon materials possesses some desirable properties, including huge specific surface area, excellent ion exchange capacity, high porosity as well as the abundant oxygen functional groups, revealing the great potential in wastewater treatment. Meanwhile, it is generally produced from various biomasses, such as crop straw, municipal waste and industrial by-products (Zhu et al. 2016; Li et al. 2014a). Compared with other materials, the feedstock of BC is abundant and of low cost. The production of BC is robust and simple with less energy consumed (< 800 °C)(Cha et al. 2016; Meyer et al. 2011), and the conversion of various waste materials into valuable BC is also helpful to reduce the environmental stress around (Kook et al. 2016). Hence, BC is viewed as a promising alternative agent in water treatment technologies. Over the past decade, the reports on the preparation of BC and its applications in wastewater treatment have increased abruptly (Fig. S1). Several key search words (TOPIC: (biochar or bio-char or bio char or biochars), AND TOPIC: (wastewater or waste water or waste-water), AND TOPIC: (remove or removal or adsorption or degradation or remediation)) were employed to retrieve publications from Web of Science Core Collection database in the years of 2008–2019 focusing on the biochar-based materials in wastewater treatment. Search results show that 1260 records matched the selected words and over 90% of document types are articles (Fig. S1 A). Comparing the yearly publications and citations in the years of 2008–2018 (Fig. S1 B and C), it can be noticed that both publication counts and citation counts present exponential growth, highlighting the increasing research interests on wastewater treatment with biochar-based materials. Figure S1 D shows the keyword co-occurrence map on applications of biochar-based materials in wastewater treatment. The bibliometric analysis indicated that several keywords (such as biochar, adsorption, heavy metal ions, cadmium, lead and chromium ions) are used frequently in articles, revealing that heavy metal ions (especially cadmium ions, lead ions and chromium ions) are the most considered contaminants in researches. The recent report from Kołodyńska et al. (2017) also demonstrated the excellent performances of commercial BC toward several types of heavy metal ions (including Cu(II), Zn(II), Cd(II), Co(II) and Pb(II)). In addition to heavy metal ions, some other types of contaminants (e.g., organic dye, phenols, etc.) have also been tried in past researches (Hao et al. 2018; De Caprariis et al. 2017). More recently, Arpita Saha and co-workers (Akech et al. 2018) have reported a commercial BC and investigated its efficiency on tetrakis(hydroxymethyl) phosphonium chloride (THPC, a water-soluble, organophosphorus salt) removal. Results showed that adsorption capacity of BC toward THPC reached up to 204 mg/g under optimized conditions, revealing the great potential and broad applicability in the wastewater treatment fields. Several research reports have also proved the excellent adsorption ability of BC in the removal of organic and inorganic contaminants from wastewater (Oladipo and Ifebajo 2018; Fan et al. 2017; Li et al. 2018b). The characteristics of BCs and use of different types of BCs for removing organic and inorganic contaminants from wastewater are reviewed and published by Inyang et al. (2016), Mohan et al. (2014) and Shaheen et al. (2018). With the increasing critical environmental standards, it is noticed that raw BC may fail to remove contaminants at high concentrations and is not satisfied with the need of selective removal of pollutants in the complicate actual wastewater (Yang and Jiang 2014; Lisowski et al. 2017). In this point, biochar-based hybrid composites generally received great attention in the wastewater treatment (Jung and Ahn 2016; Li et al. 2016, 2018). The hybrid materials usually have better performance in the wastewater treatment due to the combination of the advantages of foreign materials with BCs. For example, Deng et al. (2017) used chitosan and pyromellitic dianhydride to modify the surface of BCs, which brought more surface functional groups and strong selective adsorption toward Cu(II) ions. Except organic chemicals’ modification, a recent report from Zhu et al. (2018a) showed that molybdenum disulfide (MoS2) could also modify BCs to fabricate more efficient adsorbent. In batch adsorption experiments, the obtained MoS2@BC hybrid material exhibited excellent selective adsorption capacity toward Pb2+ ions (189 mg/g). In general, modification methods can be classified roughly into four types depending on their operation procedures: (1) heat/gas (such as steam, CO2 and ozone) activation (Li et al. 2018a; Rajapaksha et al. 2015; Li et al. 2014b), (2) acidic/alkaline (such as HCl, H2SO4 and KOH as well as K2CO3) modification (Li et al. 2014b), (3) organic/inorganic matter (chitosan, Fe3O4, MgO as well as MnOx, etc.) decoration (Han et al. 2015) and (4) nanomaterials (carbon nanotubes, graphene and layered double hydroxides as well as ZnS nanocrystalline, etc.) coating (Li et al. 2018c; Yan et al. 2014; Inyang et al. 2014). According to different demands in wastewater treatment, different biochar-based hybrid materials with desired functional groups can be well designed and produced by these methods. The resulting hybrid materials with enriched functional groups well compensate the deficiencies of raw BCs in the applications of wastewater treatment. In light of the increasing interests and advances of biochar-based materials, a number of excellent reviews and monographs have been published in the recent decade (Inyang et al. 2016; Cha et al. 2016; Shaheen et al. 2018; Ahmed et al. 2016; Tan et al. 2016; Wei et al. 2018; Wu et al. 2017a). For example, Tripathi et al. (2016) have reviewed the process parameters on production of BCs and discussed their effects on BCs yields (Tripathi et al. 2016). A recent review by Xiong et al. 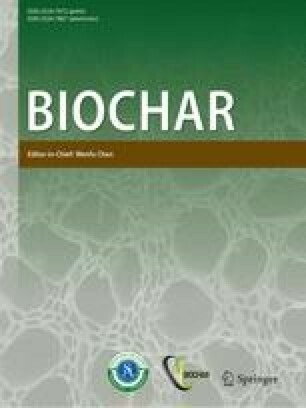 (2017) summarized the applications of biochar-based catalysts for chemical synthesis, biodiesel production and pollutant degradation. As for wastewater treatment, several comprehensive reviews were published on the aspects of heavy metal adsorption, toxic inorganic and organic contaminant removal (Inyang et al. 2016; Ahmed et al. 2016; Tan et al. 2016; Wei et al. 2018; Peiris et al. 2017). However, certain aspects such as organic contaminant removal performances and mechanisms on developed biochar-based materials are yet to be systematically reviewed. This review article presents the latest development of biochar-based materials in removal of organic contaminants from wastewater. Different types of developed BCs and biochar-based hybrid composites are summarized in the first part of this review. 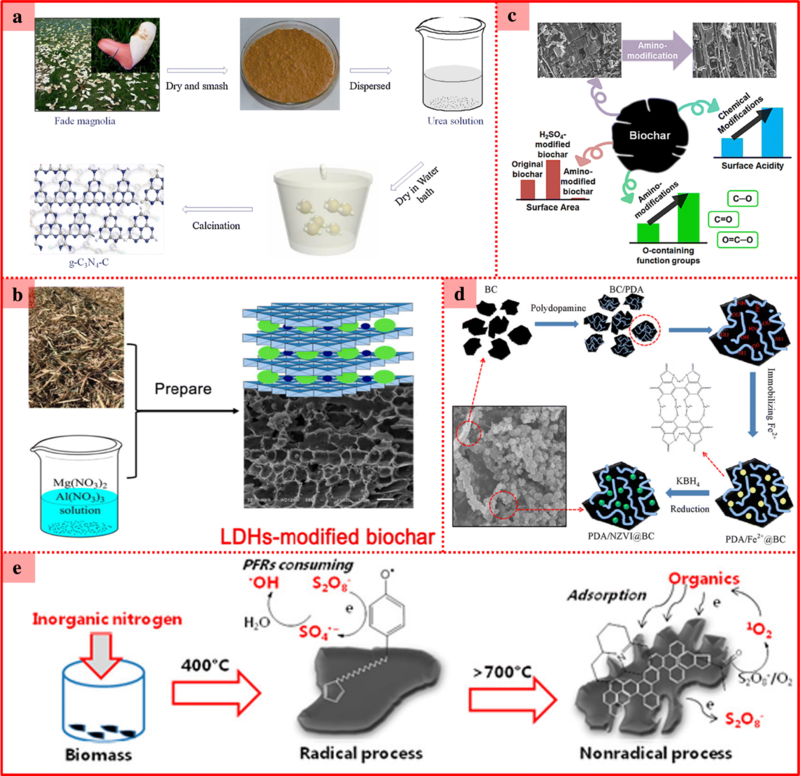 The latest environmental applications of biochar-based materials for removing organic dyestuff, phenols and pharmaceutically active compounds via adsorption/catalysis are subsequently reviewed. Also, the possible mechanisms between the contaminants and biochar-based materials are discussed in detail. This review ends with a straightforward summary and prospects about biochar-based materials in various applications, in the hope of helping the researchers to obtain a deep understanding of the interactions between biochar-based materials and contaminants and to explore the application of biochar-based materials in environmental pollution management. In general, the functionalities of materials depend on their characteristics, and the characteristics are determined by their compositions and structures. BC is the solid product from the pyrolysis of biomass at a certain temperature (< 800 °C) in the oxygen-limited environment (Tripathi et al. 2016). Different types of biomass have their own chemical compositions and structures, leading to respective pyrolysis products with different structures and features (illustrated in Fig. S2–4). Herein, we briefly introduce some BCs prepared using different types of biomass feedstocks from the latest studies and present a summary of characteristics of these BCs (as shown in Table S1). According to different provenances, these biomass feedstocks can be classified into the following categories: i) agricultural and forest residues, ii) industrial by-products and municipal wastes and iii) nonconventional materials. Agricultural and forest residues are one type of the most widely used biomasses for the preparation of BCs because of their low price and richness in natural resources (Singh et al. 2015). Agriculture, logging and other human activities generate million tons of various types of residues, such as rice husk, straws and wood chips, in each year. The biomass resource contains large amounts of lignin and cellulose content, providing powerful security for the production of low-cost BCs. Porous structure will be formed on BCs via the pyrolysis and volatilization of cellulose, which is in favor of the contaminant removal (Kumar et al. 2011). Of course, the structures of agricultural and forest residues also play a significant role in the formation of porous BCs. For instance, woody biomass, such as pine wood, usually has rigid and physically condensed structure, which could improve the stability of porous structure after pyrolysis (Fig. S2 B and D) (Lonappan et al. 2016; Lau et al. 2017). By contrast, the structure of straw biomass is so loose that is broken easily after being pyrolyzed, leading to an extremely compact structure with vaguely visible pores distributed nonuniformly (Fig. S2 H) (Sewu et al. 2017). Large amount of lignin and cellulose content in several kinds of biomass also means high contents of carbon and oxygen. It can be noticed that most BCs produced from agricultural and forest residues have higher carbon content compared to others (Table S1). Meanwhile, large amounts of carbon and oxygen in biomass may lead to higher yield of BCs and formation of functional groups (e.g., –COOH, –C–O–R, C–OH,) on BCs (Takaya et al. 2016; Fang et al. 2017; Peng et al. 2016). These functional groups could act as extra active sites to promote the removal efficiency of BCs. Industrial by-products and municipal wastes are other major sources of BCs production (Inyang et al. 2016). Unlike the agricultural and forest residues, the industrial by-products and municipal wastes involve waste from a number of sources, such as paper industry, sewage treatment industry, food processing industry and solid waste from human life (Takaya et al. 2016; Zhang et al. 2018a; Nautiyal et al. 2016, 2017; Huang et al. 2018; Kulaksiz et al. 2017). This type of biomass is a mixture of organic and nonorganic compounds, including different types of chemicals, mineral salt, bacteria, viruses and so on (Lei et al. 2017; Bratina et al. 2016; Yoon et al. 2014). Hence, BCs produced from industrial by-products and municipal wastes, such as coking wastewater treatment sludge and press cake from anaerobic digestate, usually have high amounts of ash and nonorganic components (Table S1). Takaya et al. (2016) have noted that BCs with higher ash content would have higher phosphate adsorption capacities. Besides, some types of industrial by-products, such as residues of Spirulina platensis algae biomass and coking wastewater treatment sludge, generally contain various cationic metal ions (e.g., K+, Na+, Mg2+, Ca2+). As a result, BCs produced from these types of biomass may have excellent ion exchange capacity in the removal of heavy metal ions from wastewater (Takaya et al. 2016; Ho et al. 2017). Nonconventional materials mainly involve various wastes apart from the above, including animal manure, waste cardboard, waste tire rubber, waste bones, plastics, etc. (Lonappan et al. 2016; Dong et al. 2018a; Sanchez-Olmos et al. 2017; Shah et al. 2019). Due to the wide difference in the chemical compositions and structures, the structures and characteristics of BCs produced from these biomass materials are quite different (illustrated in Fig. S4). Similar to the sewage sludge BCs, the resulting BCs from animal manure also generally have high ash content. Lonappan et al. (2016) have reported a kind of BC produced from pig manure, and the ash content was calculated to be 65.48% (Table S1). The most significant difference between the sewage sludge BC and pig manure BC is that pig manure BC has an uneven and rough surface with irregularly arranged pores (Fig. S4 B). By contrast, BC produced from sludge appears as small dots loaded on irregular granules with scattered pores on the surface (Fig. S3 B) (Zhang et al. 2018a). For the waste cardboard BC, the ash content is obviously lower than pig manure BC. And the waste cardboard BC presents a fibrous structure without proper pores (Fig. S4 D) (Lonappan et al. 2016). Waste tire rubbers usually have high volatile matter and carbon contents, which often have strong affinity to hazardous azo dye, heavy metal ions, and can be used as excellent catalysts when converted into BCs (Sanchez-Olmos et al. 2017; Choi et al. 2014; Saleh and Gupta 2014). Broadly speaking, biomasses from agricultural and forest residues usually contain larger amounts of lignin and cellulose as compared to sludge and animal manures, which means the products of pyrolysis have higher yield, higher carbon content and relatively larger surface areas under same pyrolysis conditions. Of course, the contents of lignin and cellulose in agricultural and forest residues are different from each other. Woody biomasses usually contain higher lignin content, while the leaves, straws and herbaceous plants are mostly cellulose and hemicellulose. Previous studies show that the production yield of BCs is higher in the biomass which has higher content of lignin as compared to cellulose/hemicellulose (Lv et al. 2010; Demirbas 2004). In comparison, BCs produced from industrial by-products, municipal wastes and some nonconventional materials (e.g., sewage sludge, press cake from anaerobic digestate, animal manures and waste bones) usually have higher contents of ash and inorganic composition with low energy value (Meng et al. 2018). The contents of ash and inorganic composition in BCs produced from different types of biomasses are usually in the order of wood < grain husks < straws < animal manures < sludge (Cha et al. 2016; Kameyama et al. 2016). The studies by Takaya et al. (2016) and Jiang et al. (2016) show that high ash content is good for the adsorption of phosphate and heavy metal ions (e.g., Cu2+, Zn2+). Additionally, it is also reported that more ash would weaken the adsorption capacity of BCs toward organic contaminants (e.g., carbaryl, atrazine and pentachlorophenol) by masking the active adsorption sites (Peng et al. 2016; Inyang and Dickenson 2015; Zhang et al. 2013). Even though there is wide diversity in the chemical compositions and structures of BCs, almost pristine BCs suffer from some defects such as limited functionalities and low anti-interference ability, leading to limited applications in the environmental pollution treatment (Tan et al. 2015). In order to overcome the drawbacks of BCs mentioned above and further expand the applications in the environmental pollution management, many strategies are developed to enhance its functionalities (e.g., surface area, pore volume, functional groups, etc.) through modification. The application of different modification strategies, such as pretreating the biomass and chemical modification of BCs surface, has fabricated various types of novel biochar-based hybrid materials. This section briefly introduces several types of biochar-based hybrid materials from latest reports and mainly involves magnetic BCs composites (MBC), nanometal/nanometallic oxides/hydroxide BCs composites and some other types of typical functionalized BCs. As stated above, the pristine BCs have some intrinsic drawbacks which confine the applications. Past reports revealed that most of the pristine BCs were difficult to be separated from the wastewater because of the small size (Reguyal et al. 2017). Inspired by the traditional magnetic separation technology, researchers proposed an efficient strategy to reinforce the separation by converting pure BCs to MBC (Thines et al. 2017). With the help of ferromagnetic property from magnetic matter, MBC usually can be easily separated from aqueous solutions using a permanent magnet in a magnetic field. In light of recent studies, the construction methods of MBC can be summed up as “pretreatment of biomass” and “post-loading of magnetic matter” (Table S2). The method of “pretreatment of biomass” is pretreating the biomass with Fe3+/Fe2+ or chemical coprecipitation of Fe3+/Fe2+ onto biomass before the pyrolysis (Table S2) (Chaukura et al. 2016). 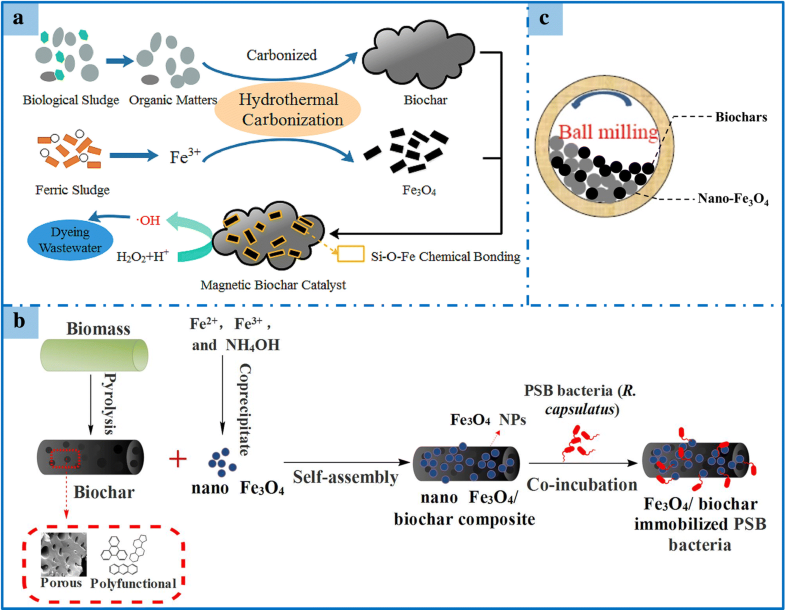 In this respect, a novel magnetic sludge-derived BC (MSDBC) was produced using FeCl2- and FeCl3-pretreated sludge (Wang et al. 2017a). The obtained MSDBC exhibited satisfactory magnetic properties (saturation magnetization (Ms) = 8.49 emu/g) and stability with low iron leaching (< 2.14% under strong acidic condition). Similarly, (Zhang et al. 2018b) fabricated a novel MBC by pyrolyzing the mixture of biological sludge and the ferric sludge through a hydrothermal carbonization procedure (Table S2, Fig. 1a). 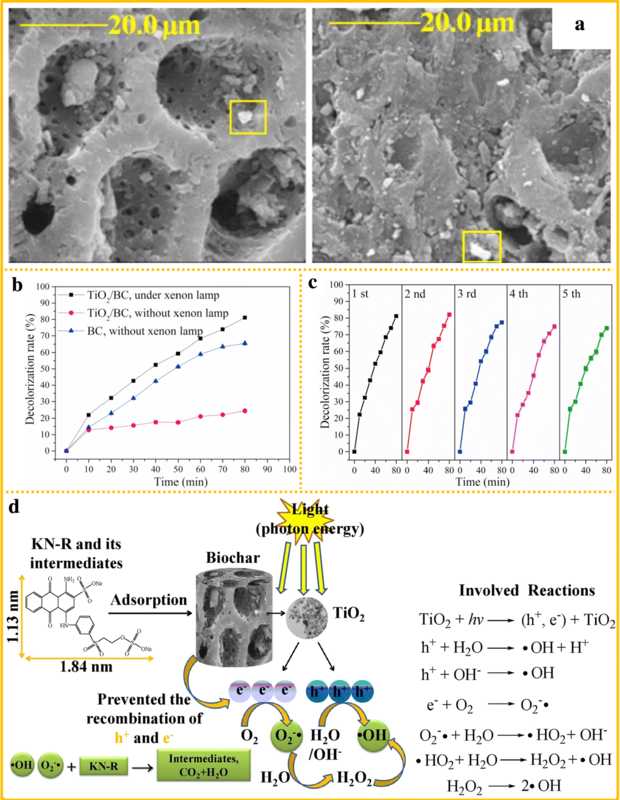 The hydrothermal carbonization method used in this work is a facile and simple pyrolysis technology without high energy consumption (Nizamuddin et al. 2017). The resulting composites exhibited excellent magnetic properties and magnetic stability (saturation magnetization (Ms) = 18.8 emu/g, remanence magnetization (Mr) = 0.17 emu/g and coercive force (Hc) = 59 Oe). Moreover, the researchers found that the obtained MBC had a smaller diameter of approximately 200 nm, a smaller pore size, a larger specific surface area and a higher carbonization degree than the pure BC produced using same method (Zhang et al. 2018b). Besides, the treatment of biomass using pre-prepared magnetic particles can also be applied to produce MBC. The obtained composite maintained the excellent magnetic properties of Fe3O4 particles (57 emu/g) and exhibited a well-developed rough and porous structure with abundant oxygen-containing surface functional groups (Dong et al. 2017). Except Fe3O4, Li et al. (2017a) noted that BiFeO3 (BFO) was also a promising additive to produce magnetic biochar. In their study, the magnetic BC composite (named BFO/BC) was synthesized via thermal treatment of Bi(NO3)3·5H2O- and Fe(NO3)3·9H2O-pretreated jute fiber biomass. Their results showed that BFO/BC harbored a smaller size and a better crystal morphology than pristine BCs. More importantly, BiFeO3 has both excellent ferromagnetic properties and high degradation capacity in removing dyes and organic contaminants from the wastewater (Li et al. 2017b; Zhang et al. 2016). The introduction of BiFeO3 significantly enhanced the functionalities of BCs in magnetic separation and organic contaminant removal. Scheme of the preparation of MBC: a Pretreating biomass with iron ions and hydrothermal carbonization; b chemical co-precipitation and self-assembly onto biochar; c ball milling. Post-loading of magnetic matter is another strategy to construct MBC via direct loading of magnetic matter on the biochar. The most widely used method should be the in situ chemical co-precipitation of Fe3+/Fe2+ on BC matrix (Trakal et al. 2016; Cederlund et al. 2016; Wang et al. 2015a). Kulaksiz et al. (2017) reported a MBC (Fe-modified BC composite) produced via a simple co-precipitation process. In this study, pristine BC was firstly prepared from paper sludge and wheat husks through conventional pyrolysis at 500 °C. Then the dried BC was mixed with a suspension of FeCl2·4H2O, FeCl3·6H2O, HCl and ethanol, which were stirred at room temperature followed by ammonia solution treatment. Later in the same year, He et al. (2017) also reported a MBC (Fe3O4/biochar) produced using a similar method (Table S2, Fig. 1b). In this report, MBC was fabricated using pre-prepared nano-Fe3O4 particles through a self-assembly procedure. The SEM, TEM and XRD results revealed that Fe3O4 nanoparticles were well dispersed on BC with little aggregation. And the resulting Fe3O4/biochar still maintained the strong magnetic property with high saturation magnetization (42 emu/g) (critical value for efficient magnetic separation is approximately 16.3 emu/g). In addition, MBC can also be produced by ball milling BCs with iron particles. Shan et al. (2016) prepared an ultrafine magnetic biochar/Fe3O4 hybrid material by using the ball milling method (Table S2, Fig. 1c). The characteristics analysis revealed that Fe3O4 particles were uniformly dispersed throughout BCs, yielding biochar/Fe3O4 particles approximately 200 nm in the main diameter after 2 h of milling. The magnetic production showed a saturation magnetization (Ms) of 19.0 emu/g for biochar/Fe3O4, which was easily separated from solution with a permanent magnet. In general, many types of nanometallic oxides/hydroxides, such as aforementioned nano-Fe3O4 and BiFeO3, have not only the functional characteristics of nanoparticles, but also the unique physical–chemical properties, such as the ferromagnetism and catalytic capacity (Zhang et al. 2016; Rajapaksha et al. 2016; Wang et al. 2018b; Chen et al. 2018b; Sun et al. 2015). The combination of BCs and nanometal/nanometallic oxides/hydroxide may endow BCs extra functionalities or strengthen its own advantages through synergetic effect. Consequently, combining BCs with various nanometallic oxides/hydroxides has been viewed as an advisable idea in the construction of highly efficient biochar-based hybrid materials. In the past several years, the nanometallic oxides/hydroxide BC composites have developed rapidly because of diversified structures and multifunctional potential. Table S2 and Table S3 display several latest types of nanometallic oxides/hydroxide BC composites, respectively. In a similar way to the MBC, nanometal/nanometallic oxides/hydroxide BC composites can also be produced through two types of synthetic routes: One is pretreatment of biomass using precursor and the other is immobilization of nanometallic oxides/hydroxide after pyrolysis. Specifically, the first type of synthetic route is using the selected precursor to modify the biomass firstly, followed by the pyrolysis under optimal conditions (Li et al. 2018d; Cai et al. 2018; Wang et al. 2015b; Li et al. 2017c). By this method, a nitrogen-doped copper biochar (N–Cu biochar) was successfully synthesized using CuCl2·2H2O as the precursor and showed irregularly shaped grooved surface morphology with elemental composition of 82.7 wt% C, 9 wt% O and 8.3 wt% Cu (Table S2, Fig. 2a) (Cho et al. 2017). Although the introduction of copper oxides resulted in a decrease in surface area, the catalytic capacity of BCs was significantly improved. In a similar route, Jung and Ahn (2016) also presented novel porosity-enhanced BC-containing periclase (MgO) nanocomposites (PE-MgO/biochar). The highlight of this work is introducing a novel fabrication process named as the CEM (combined electrochemical modification) method. In this method, the MgCl2 (the precursor of MgO) was applied as electrolyte and the marine macroalgae (biomass) was employed as host material for the production of BC composites. With the help of an appropriate voltage, MgCl2 could create strong oxidants (i.e., HOCl and OCl−) in solution by electrochemical reaction within a few minutes. Compared to traditional method, the CEM method could not only provide MgO nanocomposites binding sites but also enhance the porosity of BC surfaces (Fang et al. 2014). Meanwhile, the CEM method vastly decreases the time consumption of preparation procedures. The resulting PE-MgO/biochar produced from the newly introduced CEM method exhibited the highest surface area (56.42 m2 g−1) and highest adsorption capacity among other types of BC tested. The author attributed the significant modification in morphological and physical–chemical properties to the synergetic effect of the CEM method. Despite above CuCl2 and MgCl2, various metallic salts, such as AlCl3, CaCl2, MnCl2 and ZnCl2, have also been widely used to pretreat biomass in the production of biochar-based metallic oxides/hydroxide composites (Wang et al. 2018b; Fang et al. 2015; Wang et al. 2015c; Chemerys et al. 2018; Li et al. 2018e). The resulting composites usually exhibit dramatic changes in morphological and physical–chemical properties, leading to better performance in environmental treatment. Scheme of the preparation of: a metal–BC composites; b TiO2/BC composites; c CeO2-H@BC nanocomposites. Many studies show that nanometallic oxides/hydroxide BC composites can also be prepared through the immobilization of nanometallic oxides/hydroxide after pyrolysis (Table S2) (Lisowski et al. 2017; Zhang and Lu 2018; Kim and Kan 2016; Khataee et al. 2017). Wet impregnation is one of the commonly used methods in the immobilization of nanometallic oxides/hydroxide onto BCs (Wang et al. 2016b). For instance, Paweł Lisowski and co-workers (2017) have prepared a series of new TiO2/biochar hybrid materials: TiO2/MSP550, TiO2/MSP700, TiO2/SWP550 and TiO2/SWP700, using an ultrasound-assisted wet impregnation method (Table S2, Fig. 2b). In detail, the novel BCs used as TiO2 support were firstly produced from softwood pellet (SWP) and miscanthus straw pellets (MSP) at peak pyrolysis temperatures of 550 and 700 °C, respectively. Subsequently, the obtained BCs were treated with titanium(IV) isopropoxide (TTIP) (TiO2 precursor) suspension via an ultrasound-assisted methodology. The final products were obtained after being calcined in a furnace at 400 °C in an oxygen-deficient atmosphere. All the TiO2/MSP and TiO2/SWP hybrid materials exhibited significant modification in physicochemical properties. The TiO2-loaded BCs showed an irregular platelike structure and much higher specific surface area, which would provide more opportunities for interaction of reactants with active sites of the photocatalyst and thus lead to greater activities. Moreover, as compared with conventional wet impregnation (without ultrasound), the TiO2/biochar, which was produced via ultrasound-assisted methodology, had higher photocatalytic activity/selectivity. The best performing TiO2/SWP700 exhibited an extraordinarily high activity (~ 90%) in selective oxidation of methanol to methyl formate inflow gas phase, high selectivity to methyl formate (~ 80%) and high yield of methyl formate (~ 88%) after 240 min of illumination. The sol–gel method is another commonly used method in the immobilization of nanometallic oxides/hydroxide onto biochar. 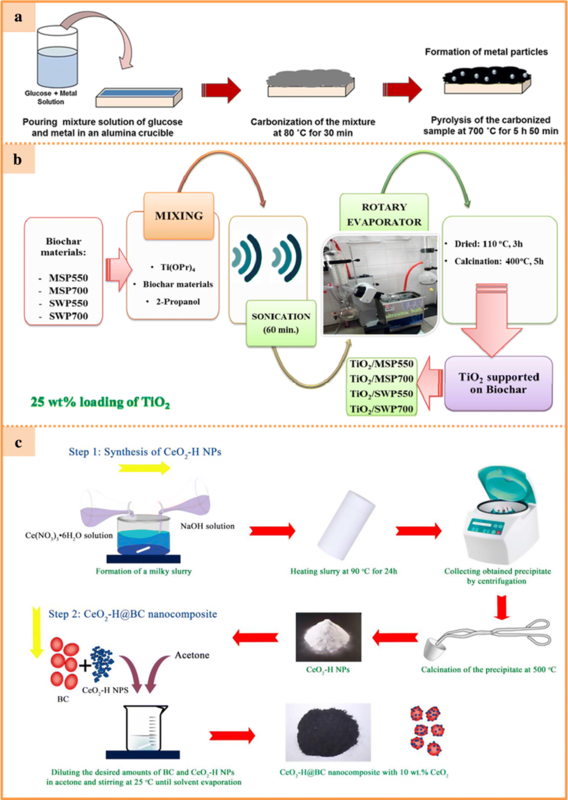 Recently, Zhang and Lu (2018) have synthesized a novel titanium dioxide (TiO2) supported on coconut shell BC by sol–gel method (calcined at 450 °C). The obtained composite exhibited an extraordinary decolorization efficiency at strong acid and alkali conditions. Similarly, Alireza Khataee and co-workers also have tried to combine the advantages of BC and ZrO2 into new functionalized BC composites. According to their report, the authors adopted a modified sonochemical/sol–gel method to fabricate synthesize ZrO2 nanoparticles on biochar. The obtained product, ZrO2-BC, exhibited higher specific surface area (29.621 m2/g) and total pore volume (5.951 cm3/g) than the bare BC (11.335 m2/g, 2.604 cm3/g), resulting in high sonocatalytic activity for the treatment of organic contaminant. Apart from the above methods, the immobilization of nanometallic oxides/hydroxide onto BC can also be achieved by depositing of pre-prepared metal oxide nanoparticle on to BC directly (Khataee et al. 2018). As shown in Fig. 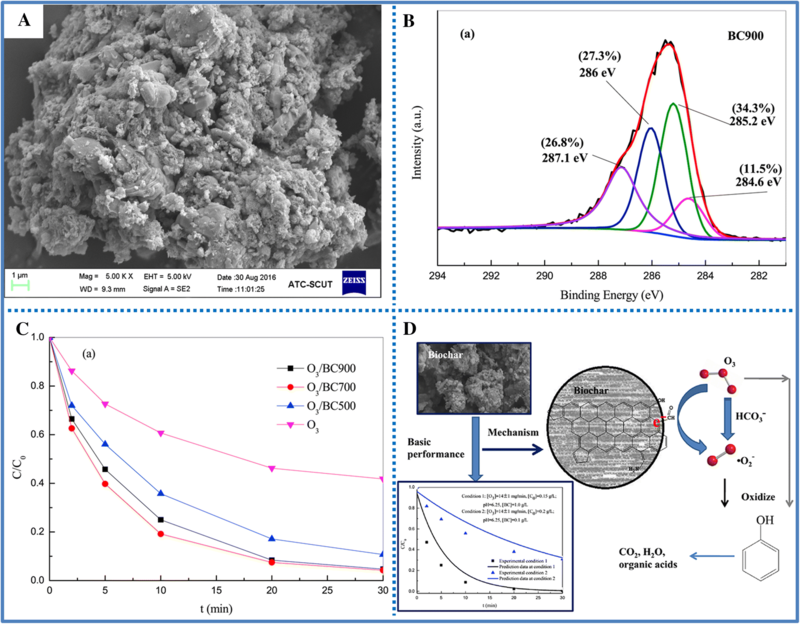 2c, the metal oxide nanoparticle CeO2 and the support BCs were presynthesized through a hydrothermal method and conventional pyrolysis, respectively. The CeO2-H@BC nanocomposite was finally prepared through diluting the desired amounts of BCs and CeO2-H in acetone so as to obtain a 10 wt% CeO2 loading, which had higher surface area, pore volume and more excellent sonocatalytic performance as compared to single CeO2-H and BCs samples. Apart from the above types of biochar-based hybrid materials, there are other types of functionalized BCs applied to expand environmental applications. 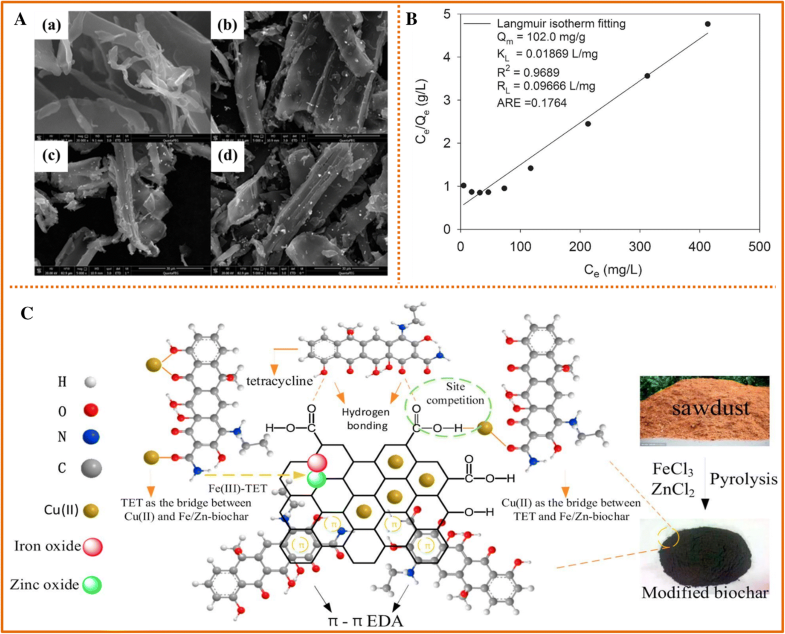 Nanoscale zero-valent iron (NZVI) is one of the most commonly used catalysts, which equipped with large specific surface area, high reactivity in adsorption and catalysis (Zou et al. 2016). Considering the striking properties of NZVI and the limited functionalities of biochar, Ning and co-workers (Wang et al. 2018c) prepared a novel PDA/NZVI@BC through a mussel-inspired strategy and in situ reduction method (Fig. 3d). An important advantage of PDA/NZVI@BC over more conventional NZVI-loaded BCs is nonconventional procedures for material synthesis. Mussel-inspired strategy has long been viewed as a promising technology for the materials surface modification because of its gentle experimental conditions and high modification efficiency (Wang et al. 2016a; Liu et al. 2014). The synergistic effect of NZVI with BCs as well as polydopamine led to significant enhancement in the removal efficiency. The resulting composites demonstrated high reactivity (98.7% of removal efficiency), excellent stability and reusability over the reaction course. Despite the metal nanoparticles loading and chemical modification, researchers found the multifunctional properties of BCs can be strongly affected by using the different element doping methods (Wang et al. 2018d; Liang et al. 2018; Wu et al. 2017b; Wang et al. 2019). On this base, Zhu et al. (2018b) fabricated an environment friendly and cost-effective material, N-doped graphitic BCs (N BCs), through the pyrolysis of mixture of wetland plants (reed) and ammonium nitrate (Fig. 3e). 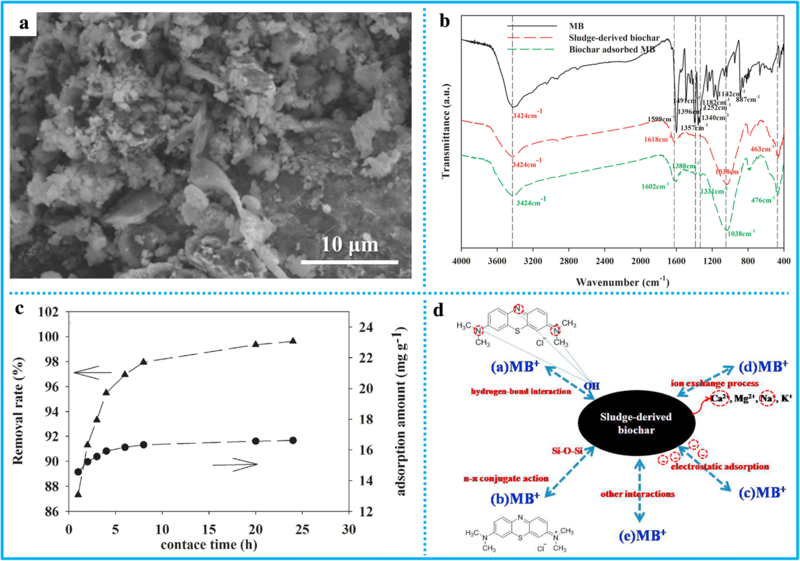 The obtained product at high annealing temperatures (> 700 °C) presented highly graphitic nanosheets, larger specific surface areas and richer nitrogen doping as compared with bare biochar, thereby achieving much higher degradation efficiency. The best performing N-BC900 showed the highest degradation rate, which was comparable or surpassing to most popular metal or nanocarbon catalysts. Scheme of the preparation of a g-C3N4-C via an in situ together growth method; b Mg/Al LDH-modified biochar; c amino-modified BC (AB), KOH-modified BC (KB), H3PO4-modified BC (PB) and H2SO4-modified BC (SB); d polydopamine/NZVI@biochar composite (PDA/NZVI@BC); and (e) N-doped graphitic BCs. Two-dimensional layer nanomaterial has long been considered as a class of famous nanomaterials in various fields because of their compelling physical, chemical, electronic and optical properties (Tan et al. 2017). Drawn by the potential promotion on the toxic contaminant removal efficiency, the coating of two-dimensional layer nanomaterials onto BCs is also viewed as a promising strategy to construct cost-effective biochar-based materials. Recently, Zhu et al. (2018c) have reported a novel graphitic C3N4-coated BC composites (g-C3N4-C) through a one-step thermal co-condensation method (Fig. 3a). The obtained g-C3N4-C exhibited a higher surface area (43.9 m2/g) and a better degradation efficiency to 2-mercaptobenzothiazole than pure g-C3N4 and BCs under the visible light photocatalytic conditions. Similarly, Wan et al. (2017) have also reported a series of nanomaterial-coated BCs, Mg–Al and Mg–Fe (3:1) layered double hydroxide (LDH)-coated bamboo BC composites, synthesized by a liquid phase co-precipitation method (Fig. 3b). The SEM, XRD and XPS results revealed BCs as an effective matrix for LDH to deposit on BC surfaces, resulting in the greatly enhanced adsorption efficiency. The advantage of this type of functionalized BC is that the final hybrid materials combine the layered structures and functionalities of coating materials with BCs. The incorporation of layered structure can influence the surface area of BC materials, which is one of the major factors for the toxic contaminant removal. Additionally, the synergistic effect (e.g., inhibition of materials stacking, cation–π interactions) between BCs and coating materials can enhance the functionalities (e.g., higher catalytic activity, larger amount of available adsorption sites), leading to better performance in wastewater treatment. Except the incorporation of BCs and foreign materials, using steaming activation, calcination or acid/alkali treatment can also improve the physical–chemical properties of BCs (Fig. 3c). Steaming activation is one of frequently used physical activation strategies which could increase the porosity and introduce more oxygen-containing functional group to BCs (Ahmed et al. 2016; Tan et al. 2016). Generally, in the activation process, the BCs is firstly made at high temperature (300–700 °C) in the absence or in the presence of oxygen in minor concentration, then transferred to a reactor and further heated at higher temperature (800–900 °C) with the agents such as CO2 and steam. The study by Bardestani and Kaliaguine (2018) has shown that high temperature steam activation is sufficient to endow BCs with large BET surface area (1025 m2/g) and high density (1.4 mmol/g) of oxygen-containing functional groups (e.g., carboxylic, carbonyl groups). Calcination/heat treatment is another widely used physical activation strategy, mainly by further heating BCs at higher temperature (800–900 °C) for a while and then supplying air or argon to introduce functional groups on BCs (Ahmed et al. 2016; Lou et al. 2016). The research from Wang groups showed that this treatment strategy can enhance the aromaticity and hydrophobicity of BCs by removing hydrophilic group (Li et al. 2014c). Acid/alkali treatments are typical chemical activation strategies, which are mainly conducted by treating BCs with acidic solution (e.g., HCl, H2SO4, H3PO4 and HNO3) or alkali solution (e.g., NaOH, KOH) (Cha et al. 2016; Wang and Yan 2011). Dalai et al. noted that KOH-treated BC exhibited higher BET surface area (783 m2/g) than the raw BC (less than 10 m2/g) (Azargohar and Dalai 2008). Table S3 also shows the changes in physical–chemical properties among surface area, pore volume, H/C, O/C and N/C ratios. It can be noticed that both H3PO4- and H2SO4-modified BCs had higher surface area and pore volume than the original biochar, which was attributed to wet sulfuric oxidation processes (Lau et al. 2017). The study by Peng et al. also demonstrated that acid-wash treatment toward reed BCs decreased their ash content, H/C and O/C ratios, indicating acid-washed reed BCs became more hydrophobic and aromaticity (Peng et al. 2016). Interestingly, there was a slight decrease in the surface area and pore volume for KOH-modified BC and a substantial reduction with amine-functionalized biochar. A similar result was found in the study by Wang et al. (2017b). The authors put this down to the remarkable destruction of pores during highly oxidative acidic modification and pore blockage by the grafting of amino functional groups. Overall, BCs regardless of acid/alkali or amine group modifications demonstrated excellent performance in environmental applications. As compared with physical activations, the activation efficiencies of chemical activations are superior and conspicuous, but chemical activation strategies also suffer from several drawbacks, including the corrosion of equipment by acid/alkali agents and high cost and reclamation difficulty of chemicals. These factors play important role in commercial production and applications. Hence, in addition to the promotion of activation efficiencies, more facile and eco-friendly fabrication process should also be recommended for future biochar research. Organic dyestuff is one of the most prevalent contaminants, which are usually produced along with textiles, rubber, paper and dye manufacturing (Yagub et al. 2014; He et al. 2018). These types of contaminants have the characteristics of excellent chemical stability, good solubility in water, high colority and complex aromatic structure, which is difficult to be decomposed naturally. The presence of these colorful contaminants in water can restrict light and oxygen getting into water, leading to serious threat to the survival of aquatic organism. Besides, most organic dyestuffs, such as azo dyes and anthraquinone dye, are toxic or carcinogenic to human body (Huang et al. 2017; Mahmood et al. 2016; Donadelli et al. 2018). In order to remove these refractory contaminants effectively, many advanced technologies, such as membrane separation (Damodar et al. 2010), photocatalysis (Wu et al. 2017c), adsorption (Ersan et al. 2017) and advanced oxidation (Nidheesh et al. 2018), have been tried and applied in the wastewater treatment. Among these methods, adsorption and catalysis have been considered as the most acceptable and efficient dye removal approaches because of the high efficiency, low cost and easy operation (Adeyemo et al. 2015). For cost-effective and highly efficient adsorption/catalysis, the adsorbent/catalyst equipped with abundant active sites is indispensable. Taking into consideration of the existence of easily available raw material sources (agriculture or forestry waste, etc. ), huge specific surface area, high porosity and abundant oxygen functional groups, as well as excellent electronic transmission capacity, BCs have been considered expected to be a cost-effective adsorbent or catalyst matrix to provide large amount of active sites for binding organic dyes via hydrogen bond interaction, n–π conjugate action, electrostatic adsorption, ion exchange process or other interactions, which have stimulated extensive research on the biochar-based materials. Here, we would demonstrate several typical examples of BCs and biochar-based hybrid materials with excellent performance for the elimination of organic dye contaminants. Relevant adsorption capacity/removal efficiency and mechanism of various organic dyes with biochar-based materials are also compared and summarized in Table S4. Based on the porous structure and abundant surface functional groups, a typical example is the direct use of BCs as adsorbent for the organic dye removal. For instance, Fan et al. (2017) have investigated a novel sewage sludge-derived BC as adsorbent to remove MB, a typical component of dyeing wastewater. The removal efficiency of MB reached up to nearly 100% within 10 h (Fig. 4c). The maximum adsorption capacity was calculated to be 29.85 mg/g at pH 7. The high removal efficiency was attributed to the coarse and porous texture structure with a relatively large surface area (25 m2/g) (Fig. 4a). The presence of abundant functional groups and various metal ions (e.g., Ca2+, Mg2+, Na+, K+) provided large amount of binding sites for the MB adsorption through electrostatic interaction, ion exchange, hydrogen bond interaction and n–π interaction (Fig. 4b, d). Considering the higher adsorption capacity and lower cost, Dastidar and co-workers developed a new type of BC derived from residue of Spirulina platensis algae biomass and used it as adsorbent in the Congo red (CR) (Nautiyal et al. 2017) and MB adsorption (Nautiyal et al. 2016), respectively. The adsorption performance of obtained BCs toward CR (82.6%) and MB (92.6%) were found to be comparable to the commercial activated carbon (85.4% for CR, 95.6% for MB) under same conditions, revealing the great potential in dyeing wastewater treatment. The maximum adsorption capacity of MB (57.80 mg/g) was observed at alkaline pH with adsorbent dosage of 2000 mg/L and initial concentration of dye of 90 mg/L. Interestingly, the highest specific uptake of CR (51.28 mg/g) was observed at acidic pH of 2 with 2000 mg/L of adsorbent dosage and 90 mg/L of initial CR concentration. The sole difference was ascribed to the electronic interaction between the adsorption sites on BCs and cationic dye MB/anionic dye CR. These results further demonstrated a promising candidate for the application of removal of organic dye contaminants from acidic/alkaline wastewater. Besides, BCs produced from pine wood, pig manure, cardboard, tea waste, Korean cabbage and rice straw, as well as wood chip, have also been developed and employed to remove organic dye contaminants in recent years (Table 1) (Lonappan et al. 2016; Sewu et al. 2017; Fan et al. 2016). Experimental results revealed that the higher ash content and larger surface area allowed for the availability of a greater number of adsorption sites, resulting in higher affinity for organic dye contaminants. a SEM image of sludge-derived biochar; b FTIR spectrum of pure MB, sludge-derived BC and BC adsorbed MB; c adsorption performance of BC toward MB (experimental condition: adsorbent dosage: 6 g/L, CMB = 100 mg/L, V = 20 mL, 25 °C, pH 7); d possible mechanisms in the biochar-MB system. To some extent, however, the adsorption capacity of pristine BCs is too low to meet the practical demands, possibly stemming from the limited functionalities (e.g., the poor hydrophilic property, limited surface area and active sites). In this aspect, biochar-based hybrid materials gradually receive great attention. These types of hybrid materials provide opportunities to satisfy the demand of low-cost adsorbents with better removal efficiencies by combining the advantages of foreign materials with BCs (Table S4) (Wang et al. 2018d; Guzel et al. 2017; Chen et al. 2018c). For example, a previous study (Wang et al. 2017c) reported a type of Al2O3 nanoparticle-coated BCs and investigated its adsorption capacity toward MB. Batch experiments showed that maximum MB adsorption capacities reached up to 26.8 and 35.0 mg/g at 25 °C for the pristine BCs and Al2O3 nanoparticle-coated biochar, respectively. Similarly, Kalderis and co-workers (2017) fabricated Fe-modified BCs to remove organic dye malachite green. The obtained Fe-modified BCs presented a higher surface area and pore volume compared with that of pristine biochar, thereby achieving higher removal percentage toward malachite green (Tables S3 and S4). Moreover, the introduction of magnetic particles allowed the adsorbent to be efficiently collected from aqueous solution by using a magnetic field, thus avoiding the secondary pollution due to the residual adsorbents. Broadly speaking, introduction of these metallic nanoparticles or layered nanomaterials onto BCs can influence the surface area, porosity and surface functional groups as well as extra functionalities (e.g., magnetic separation recovery ability, well particle dispersion). These improvements provide great benefits in the organic dye removal in water. In addition to adsorption, catalytic degradation has also been widely accepted as a cost-effective approach for the dyeing wastewater treatment (Zangeneh et al. 2015). Various excellent catalysts such as TiO2, ZnO, CdS and Ag nanoparticles have been developed for the photocatalytic degradation of dye contaminants (Khan et al. 2014; Fu et al. 2015; Kong et al. 2017; Wang et al. 2017d). Being characterized by the porous structure, outstanding conductivity and stability, and special electronic and optical properties, BC is considered to be perfect support to composite with these excellent catalysts. The resulting hybrid materials usually present better performance in dye contaminant removal due to the congregation of intrinsic properties of BC and excellent catalytic ability of catalysts nanoparticles. For example, Zhang and Lu (2018) fabricated a TiO2-supported coconut shell BC for the photocatalytic decolorization of Reactive Brilliant Blue KN-R. Under the UV high-pressure xenon lamp (300 W), the obtained TiO2/BC composites exhibited higher decolorization rate (81.09%) of KN-R than that without xenon lamp (Fig. 5b). In comparison, the pristine BCs was also used in the decolorization of Reactive Brilliant Blue KN-R and presented an amazing decolorization rate (65.48%) without illuminant. The excellent performance of pristine BCs in the decolorization of Reactive Brilliant Blue KN-R was ascribed to the neat macropores with a diameter of 15–20 μm through adsorption process (Fig. 5a). The porous structure of BCs allowed it to be appropriate support for the fine distribution of TiO2 nanoparticles. It is well known that TiO2 nanoparticles can produce holes h+ and electrons e− when TiO2 adsorbed enough photon energy which was equal or higher than its band gap (Egap of anatase TiO2 is equal to 3.2 eV). The photogenerated holes h+ could react with H2O and OH− to produce hydroxyl radicals •OH, and the photogenerated electrons e− could be trapped by O2 that further produced superoxide radicals •O2− (Fig. 5d). These two types of radicals possessed high oxidizability, which could efficiently oxidize the KN-R molecules and its intermediates. Besides, it is reported that BC could prevent the reunion of h+ and e− that enhanced the transfer of electron–hole pairs (Zhang et al. 2017). As a consequence, the cooperation between BC and TiO2 further improved the removal efficiency of Reactive Brilliant Blue KN-R. The highest decolorization efficiency reached up to 99.71% and 96.99% occurred at strong acid and alkali conditions (pH 1 and 11), respectively, within 60 min. Five cycles of photocatalytic reactions using the same recycled catalyst resulted in the efficient removal of Reactive Brilliant Blue KN-R (> 70%) which confirmed the durability and reusability of TiO2/BC composites on Reactive Brilliant Blue KN-R decolorization. Apart from the TiO2, Khataee and co-workers (2018) employed a hydrothermal method to fabricate novel ceria nanoparticle-incorporated BCs, CeO2-H@BC nanocomposite, for Reactive Red 84 (RR84) degradation. The obtained CeO2-H@BC nanocomposite exhibited much higher catalytic degradation efficiency as compared to single CeO2-H and BCs samples in an ultrasonic bath. The highest degradation efficiency (98.5%) was obtained with a CeO2-H@BC amount of 1 g/L, ultrasonic power of 450 W, pH of 6.5 and initial RR84 concentration of 10 mg/L. The significant improvement was attributed to the synergistic effect between ceria nanoparticles and BCs. The presence of ceria nanoparticles could increase the number of cavitation bubbles formed on the surface of catalysts and the mass transfer rate of RR84 molecules from liquid to the catalyst surface, leading to more cleavage of water molecules and production of further •OH radicals. The metals in BCs have vacant d-orbitals which could be served as π acceptor metals to accept electrons. Hence, more reactive oxidizing agents including •OH, H2O2 and •O2− could be easily generated, and then, the sonocatalytic degradation was enhanced. And the degradation efficiency had no obvious drop after three-cycle operation (95.8%, 93.2% and 92.8%, respectively), revealing the durability and reusability on the degradation of RR84. Of course, some other catalysts such as ZrO2 and Fe3O4 have also been developed to synthesize biochar-based composites for the dye contaminant degradation (Table S4) (Zhang et al. 2018b; Wang et al. 2017a; Li et al. 2018d; Cai et al. 2018; Khataee et al. 2017; Wang et al. 2017b; Park et al. 2018). The enhancements of dye removal efficiencies and related removal mechanisms have been confirmed through various characterization methods and batch experiments. In general, the main effects of the hybridization toward BCs can be classified into two types: One is the promotion of physicochemical properties, such as larger surface area, higher pore volume and more surface functional groups, and the other is the introduction of new functionalities, such as the photocatalytic capacity from TiO2 nanoparticles (Table 1). These synergistic effects significantly increased the removal efficiencies. a SEM images of TiO2/BC composites (the boxes in the image show the loaded TiO2 nanoparticles); b different decolorization rates of KN-R (experimental conditions: pH 8.71, initial concentration of 30 mg L−1, TiO2/BC or BC dosage of 6.0 g L−1); c different decolorization rates of KN-R during five recycling experiments (experimental conditions: pH 8.71, initial KN-R concentration of 30 mg L−1 and TiO2/BC dosage of 6.0 g L−1); d proposed interaction mechanisms for the decolorization of KN-R.
Phenolic compounds, such as phenol, bisphenol A (BPA), p-nitrophenol (PNP) and pentachlorophenol (PCP), are one common type of prevalent organic contaminants that are mainly generated from organic synthesis, paper and plastic manufacturing as well as agricultural activities (Yu et al. 2017; Lisowski et al. 2017; Peng et al. 2016; Zhang et al. 2018a; Cho et al. 2017; Michałowicz and Duda 2007; Niu et al. 2018; Vlastos et al. 2016). Chemical intermediates, such as 4-amino-5-hydroxynaphthalene-2,7-disulfonic acid (H acid) (Li et al. 2017a), diethyl phthalate (DEP) (Abdul et al. 2017), as well as 2-mercaptobenzothiazole (MBT) (Zhu et al. 2019), are commonly used chemical agents for the production of dyestuff and pesticides. Both of these organic compounds contain aromatic and heteroaromatic molecular structures. The stable structures make these compounds difficult to be biodegraded (Cho et al. 2017; Michałowicz and Duda 2007; Niu et al. 2018). Moreover, these compounds are found to be highly poisonous to the cells of human bodies. High dosage intake (over 1000 mg/kg) or prolonged exposure to these compounds would cause acute/chronic poisoning or even death (Vlastos et al. 2016). It is urgent and necessary to develop efficient technology and excellent materials to eliminate these toxic compounds from aquatic environment. Considering the low cost and excellent performance in organic dye treatments, biochar-based materials provide an attractive selection for the phenols contaminant removal (Table S6). Zhang et al. (2018a) reported that BCs synthesized by pyrolysis of sludge could effectively remove phenol from aqueous solution via ozonation. In this work, a series of BCs, BC500, BC700, BC900, pyrolyzed at different temperatures (500, 700, 900 °C) were produced and used as catalysts in ozonation of aqueous phenol. It was found that over 95% of phenol was removed within 30 min by using BC700 and BC900 (Fig. 6C). The phenol degradation efficiency by using BC500 also reached up to 89.3%. The highly comparable removal efficiencies were ascribed to the surface morphologies with huge specific surface area and abundant carbonyl groups on BC surface (Fig. 6A, B). In the ozonation of aqueous phenol, these electron-rich carbonyl groups acted as active sites to adsorb dissolved ozone within surface region and offer electrons to molecular ozone to accelerate the decomposition of ozone and generation of •O2−; meanwhile, this process enabled these carbonyl groups to be oxidized into carboxyl groups by ozone; the presence of bicarbonate would further stimulate the generation of •O2− through a series of reactions (Fig. 6D). The rapid manufacture of •O2− and its strong oxidizability degraded a high percentage of phenol within a short time. In the same year, Huang et al. (2018) synthesized a BC originating from sewage sludge and used it as activator to activate persulfate for the catalytic degradation of BPA. In this work, the metal in the sludge precursor was found to be of great importance for the high degradation efficiency of BPA. The BPA degradation process was dominated by singlet oxygen which was catalytically produced by the ketone structure inside the biochar. All BCs produced with 5% mixed metal ions showed excellent BPA removal efficiency (> 90%), which were much higher than that of BCs without the addition of metal ions. A SEM image of BC900; B C 1 s XPS characterization of BC900; C catalytic performances of phenol by BC (experimental conditions: BC dosage of 1.0 g/L; 22 ± 3 °C; initial phenol concentration of 0.2 g/L; initial O3 concentration of 14 ± 1 mg/L with flow rate 1.0 L/min); D proposed interaction mechanism of ozonation procedure (the insert shows the empirical kinetic model fitting at two different experimental conditions). It has been reported that BCs with the functional groups containing O, N and S atoms also possesses catalytic degradation ability toward chemical intermediate contaminants (Colmenares et al. 2016). On this basis, Fang et al. (2017) prepared four different BCs (named as P300, P500, W300 and W500) and used them as catalysts in the DEP degradation. The experiments showed that the DEP was efficiently degraded and partially mineralized under UV and simulated solar lights by biochar. About 58.9%, 72.3%, 52.3% and 60.9% of DEP was removed within 120 min by P300, P500, W300 and W500, respectively. The better performance of P500 compared with P300 was ascribed to that increasing pyrolysis temperature favored persistent free radical (PFR) formation. The gap of DEP degradation efficiency between P500 and W500 was due to the different contents of BC carbon matrix (BCM) and dissolved organic matter (DOM). The BCs containing a large amount of DOM has a relatively higher ability to induce the formation of 1O2, while BCs containing a high amount of BCM-PFRs can effectively induce the formation of more •OH under lighting, as identified by EPR technique and free radical quenching studies. To some extent, whether acted as adsorbents or catalysts to remove phenols, the removal capacities of pristine BCs are inferior to those of biochar-based hybrid materials. Many studies have demonstrated that the combination of BCs with other materials has better performance in the wastewater treatment (Table 2) (Thines et al. 2017; Khataee et al. 2018; Chen et al. 2018c). For example, Lisowski and co-workers (2017) fabricated a series of new TiO2/BC hybrid materials and applied them in the photocatalytic phenol degradation under UV and visible light. The produced hybrid materials were named as TiO2/MSP550, TiO2/MSP700, TiO2/SWP550 and TiO2/SWP700, respectively, according to the different feedstocks (miscanthus straw pellets and softwood pellets) and pyrolysis temperature (550 and 700 °C). The degradation experiments showed that over 64% of phenol was removed by the TiO2/MSP700 under UV light, while degradation efficiency of pristine BCs was less than 6% under the same conditions, indicating the significant enhancement of catalytic activity of TiO2/BCs composites. Meanwhile, the degradation efficiencies of TiO2/MSP700 and TiO2/SWP700 were found to be higher than that of commercial TiO2 nanoparticles under the same procedures, revealing the positive role of BCs in improvement of the catalytic capacity of biochar-based composites. Moreover, the photocatalytic selective reaction activity (~ 90%) and stability of TiO2/MSP700 were extraordinarily high. Only ~ 10% loss of phenol conversion could be observed after successive five cycles of the photooxidation reactions. The photocatalytic degradation of phenol under UV and visible illumination involved the reactive radical species of h+ •OH and •O2−. It has been mentioned in the previous section that TiO2 could induce electrons e− to generate reactive radical species and BCs have the ability to inhibit the recombination of e−–h+ pairs. The cooperation between BCs and TiO2 greatly contributed to the higher catalytic capacity of TiO2/BCs composites. Similarly, a metal-free biochar-based photocatalyst of g-C3N4-C composite was synthesized and employed to catalytic degrade MBT (Zhu et al. 2018c). Under the same conditions, g-C3N4-C composite exhibited much higher MBT degradation efficiency (90%) than pure g-C3N4 (49%). In this research, BC was served as terminal electron acceptor. After the excitation of visible light, the photogenerated electrons would transfer to the BC surface and react with O2 to produce the active species •O2−. The strong oxidizability of these reactive oxygen radicals resulted in the outstanding performance of g-C3N4-C in MBT degradation. Meanwhile, the introduction of BCs on g-C3N4 inhibited the accumulation of nanolayers, which maximized the efficiency and durability of g-C3N4 catalyst. The contamination of harmful pharmaceutically active compounds in water has also become a pervasive problem worldwide (Yan and Song 2014; Ma et al. 2017). With increasing health awareness and higher health standards, the consumption of various pharmaceuticals, such as antibiotics, anti-inflammatory drugs and analgesics, has increased a lot in recent years, which also derived more serious environmental problems due to the increased release of wastewater which contains large amount various pharmaceutically active compounds (Jain et al. 2018; Boxall 2018). As an instance, the gradual accumulation of antibiotics in water would result in the generation of drug-resistant bacteria, which would be killed with more powerful antibiotics, and then getting trapped in a vicious circle (Bougnom and Piddock 2017; O’Flaherty et al. 2019). Moreover, these pharmaceutically active compounds may enter animals and human bodies through food chain, resulting in serious health threaten. Therefore, it is urgent to search for efficient materials and approaches to remove these contaminants from wastewater. Biochar-based materials have also shown great potential in the removal of these harmful pharmaceutically active compounds (Table S6) (Zhu et al. 2018b). Frontistis et al. (Kemmou et al. 2018) pyrolyzed malt rootlets to generate BC and used it to activate sodium persulfate (SPS) for the oxidation of sulfamethoxazole (SMX), a representative antibiotic belonging to the family of emerging micro-contaminants. In the presence of 250 mg/L SPS and 90 mg/L BC, the compound SMX (250 μg/L) was rapidly degraded, and the degradation efficiency analyzed by high-performance liquid chromatography (HPLC) was 94% after 30 min of reaction. Besides, BC/SPS system could maintain consistent degradation performance in different water matrices (pure water, bottled water, treated domestic wastewater) and the effect of radical scavengers (alcohols as radical scavengers) was minor. A similar study was carried out by Zhu et al. (2018b) using wetland plants (reed) BC as catalyst for peroxydisulfate (PDS) activation and the degradation of SMX in water. In this work, ammonium nitrate was used to pretreat the biomass to improve the N content in biochar. BCs produced at high annealing temperatures (> 700 °C) exhibited high N content, large specific surface area and highly graphitic nanosheet structures. The doping of N provided abundant adsorption sites to bind organic contaminants via electrostatic force and also bind with PDS molecules to form metastable surface-confined reactive species, which could effectively oxidize the co-adsorbed organic contaminants through the direct electron transport manner. As a consequence, 100% removal of SMX at 20 mg/L was achieved in 20 min by N-BC900, which was comparable to that of many famous carbon materials, such as carbon nanotubes (Lee et al. 2015) and N-doping graphene (Duan et al. 2015). Many studies showed that the combined use of BCs with metal oxides/metal nanoparticles could achieve higher removal efficiency in removal of pharmaceutically active compounds (Table 3) (Shan et al. 2016; Kim and Kan 2016; Taheran et al. 2017). Zhou et al. (2017) reported a novel iron and zinc co-doped sawdust BC (Fe/Zn biochar) and employed it to remove tetracycline (TET) from aqueous solution. The resultant composite presented a rough surface with evenly distributed crystal particles (Fig. 7A). In the application of TET removal, the Fe/Zn BC showed better performance than the pure biochar, Fe biochar and Zn biochar. This was attributed to the higher surface area and larger pore size which provided more active sites to bind TET molecules via hydrogen bonding, π–π electron donor–acceptor (EDA) and Fe(III)-TET (Fig. 7c). The maximum adsorption capacity of Fe/Zn BC was estimated to be 102.0 mg/g (Fig. 7b), revealing the great potential in the practical TET treatment. More recently, Wang et al. (2018c) have immobilized a novel nanoscale zero-valent iron (NZVI) on polydopamine surface-modified BC (PDA/NZVI@BC) composite for the removal of TET. The removal efficiency of TET is increased by 55.9% after being loaded with NZVI. The better performance was ascribed to the efficient dispersion of NZVI onto PDA-modified BC (BC/PDA) with large specific surface area, as well as synergistic effect between NZVI and BC/PDA. The large amount of NZVI could induce electrons to react with H2O to generate reactive species like H*, which could effectively induce the TET on account of its high reducibility. Similarly, a cobalt oxide-immobilized BC (BC-Co3O4) composite was fabricated for the catalytic degradation of ofloxacin (OFX), a kind of fluoroquinolone antibiotic (Chen et al. 2018b). The degradation experiments showed that over 90% of OFX was removed within 10 min by BC-Co3O4/Oxone system, which was much higher than using only Oxone, only BCs and Co3O4/Oxone system. The cooperation of cobalt oxides with peroxymonosulfate (PMS) is a highly effective process for the generation of SO4•−. The abundant oxygen-containing functional groups on BC surface promoted the generation of Co–OH group, which played an essential role in high radical yields. Moreover, the combination of Co3O4 with BCs could inhibit its aggregation effectively. Thus, fine distribution of Co3O4 on BCs with huge specific surface area brought abundant oxidizing species through the heterogeneous activation on the surface of catalyst, so the extraordinary activity for PMS activation and the degradation of organic contaminants were achieved. In addition, BC-Co3O4 composite still preserved high degradation efficiency (> 90%) after three cycles under same conditions, clearly demonstrating its excellent catalytic capacity and reusability in the treatment of wastewater-containing pharmaceutically active compounds. A SEM images of P BC (a), Fe BC (b), Zn BC (c), Fe/Zn BC (d); B Langmuir isothermal fittings for TET adsorption on Fe/Zn BC; C proposed interaction mechanism for adsorption between TET and Fe/Zn BC. The economic analysis of biochar-based materials plays an essential role in their further development and commercial applications (Ng et al. 2017). In particular, low cost is one of the key advantages of biochar-based materials and usually emphasized in the design and fabrication process. Hence, it is necessary to look at enough cost information about biochar-based materials. The cost of biochar-based materials originates from many aspects, including the raw materials collection and transportation, fabrication strategies, production conditions and scale, as well as equipment depreciation. As for the raw materials collection and transportation, the cost mainly depends on several parameters, such as the price of raw materials, transportation cost and biomass availability. Prices of the feedstock and foreign materials for BCs modification vary in different regions. Brown et al. (2011) reported that corn stover feedstock generally ranges in price between $0 and $83 per metric tonne ($75 per short tonne). A report showed that the costs of wood waste, garden and green waste, food waste, sewage sludge, are approximately £50 (US$ 78), £22 (US$ 34), £35 (US$ 55), £45 (US$ 70) per tonne, respectively, in the UK (Shackley et al. 2014). Comparatively speaking, the costs of biomasses from industrial by-products and municipal wastes are lower than that from agricultural and forest residues. The transportation costs of raw materials mainly depend on the local transport pricing and the haul distance. The detailed cost can be calculated according to the local real-time price. Shackley et al. (2014) reported an estimated price for the transportation cost of £15 (US$ 23) per tonne in the UK. Meanwhile, biomass availability also plays an import role in the final cost. Shackley et al. (2014) summarized a wide range of UK biomass resource availability values and found that most of the biomasses cannot be used completely in BC production. For example, the theoretically available biomass (wheat straw) resource for bioenergy reaches up to 6,300,000 tyr−1 o.d., while the realistically available biomass (wheat straw) resource for pyrolysis–biochar systems is 4,725,000 tyr−1 o.d. (Shackley et al. 2014). Except the parameters mentioned above, fabrication strategies, production conditions and scale, as well as equipment depreciation, can affect the production cost a lot. The production scale and conditions mainly influence energy consumption. Fabrication strategies determine the types and dosage of raw materials, as well as the production conditions. Proper strategy optimization can further reduce the final production cost. Due to the absence of detailed data on the aforementioned aspects and complicated factors, the final production cost of biochar-based materials is difficult to be calculated precisely. The investigation by Meyer et al. (2011) showed that the direct production cost (excluding the opportunity costs) was found to be approximately 50 US$ per tonne dry feedstock (or 172 US$ per tonne BCs at 29% wt BCs yield). Of course, this cost value did not apply to all situations. Hence, Shackley et al. (2014) and Kulyk (2012) provided a rough range of 50-682.54 US$ per tonne BCs. Among the different types of BCs, the production cost of woody BCs is approximately 91-329 US$ per tonne, which is only one-sixth that of commercial activated carbon (1500 US$ per tonne) (Galinato et al. 2011; Kurniawan et al. 2006), revealing the great potential in the future commercial applications. Up to now, many promising biochar-based materials have been fabricated and exhibited excellent performances in the wastewater treatment; however, most of the researches just stay in the laboratory. According to the reported literatures and economic analyses, the possible reasons affecting the commercial application lie in two respects below. One is the indeterminacy of actual removal efficiency. It is well known that the many studies of biochar-based materials in wastewater treatment are achieved in a simulated environment under ideal conditions. Due to the long period of field trials and complicated factors in actual wastewater, large-scale study in actual wastewater is rare. Therefore, it is uncertain that high removal efficiency can be achieved in actual wastewater with the interference of unknown factors. Besides, there are certainly questions about the quality of final products in large-scale production. These questions need to be answered by more evidences from large-scale experiments. Another one can be ascribed to the intrinsic defects in fabrication process, including the actual production cost and potential environmental influence. Some types of biochar-based materials have excellent performance and low production cost (Sewu et al. 2019), but potential environmental influences from the strong acid/alkali are ignored. The excellent performances of biochar-based materials in organic contaminant removal have been demonstrated by many studies, but the potential risk of biochar-based materials in wastewater treatment fields should not be ignored (Lian and Xing 2017). Broadly speaking, the potential risk toward environment mainly has two types according to the risk resources. One is from the production process of biochar-based materials and the other one is the unconscious release of toxic elements from biochar-based materials. As we all know, in comparison with activated carbon, BC is the pyrolysis product of biomass at low temperatures (300–800 °C) and without activation process, meaning the product is not fully carbonized. This makes it possible to form various organic chemicals, such as volatile organic compounds (VOCs), dioxins and polycyclic aromatic hydrocarbons (PAHs), as well as furans (PCDD/DF) (Lyu et al. 2016). In general, the production yield of BC at lower pyrolysis temperature is higher, but the degree of toxicity is higher. The study from Lyu et al. (2016) showed that PCDD/DF and PAHs are the most produced chemicals at temperatures of 300–400 °C. It can be inferred that if BCs are produced in large scale, the accompanying pollution is unbearable. Moreover, the fabrication of several biochar-based materials involves strong acid/alkali/oxidant (e.g., H2SO4, HNO3, KOH and KBH4) (Dong et al. 2017; Wang et al. 2018c), and the resultant effluent in mass production may be also a challenge or pollutant source. In addition to the above-mentioned potential risk, the toxic elements or nanoparticles in biochar-based materials should be considered. Some types of BCs may contain some metal contaminants (e.g., Cu, Cd and Pb) (Stefaniuk et al. 2016) or other toxic elements, which are mainly originated from heavy metal/toxic elements-containing feedstocks such as sewage sludge, industrial solid waste and residue of biogas production. When applying in the water treatment, these toxic elements or metal contaminants may be released into water, leading to secondary pollution. In addition, nanomaterials (e.g., TiO2, MgO, graphene oxide, etc.) in biochar-based materials may also be leached out after being used for several times and recycled, leading to unintended harm to environment (Arabyarmohammadi et al. 2018; Aruoja et al. 2009; Jiang et al. 2009). On this point, the future researches in BCs should be conducted to optimize the fabrication process of the biochar-based materials and improve their stability before and after use, so as to minimize or eliminate the potential release of these toxic contaminants to the environment. In this review paper, we summarized the recent progress on the BC-based materials and their applications in the removal of organic contaminants from wastewater. Driven by the high efficiency and low cost, a variety of BCs and BC-based hybrid materials have been developed in the last few years. The wide diversity of biomass, such as agricultural and forest residues, industrial by-products as well as municipal wastes, endows BCs different chemical compositions and structures. The huge specific surface area, high porosity and abundant oxygen functional groups on BCs provide large amount of active sites for binding organic contaminants via hydrogen bond interaction, n–π conjugate action, electrostatic adsorption, ion exchange process or other interactions. The performances of many BCs are comparable or superior to commercial active carbon and CNTs. Furthermore, the porous structure and abundant functional groups of BCs also allow it to be a practical platform to combine with other functional materials. The combination of BCs with nanometal/nanometallic oxides/hydroxide, nanomaterials coating or treatment with chemical active agent leads to more efficient adsorbents/catalysts with multifunctionalities. For instance, BC combined with magnetic nanoparticles can exhibit higher removal efficiency of dye contaminants through Fenton-like oxidation reaction and be easily separated by magnetic field. The TiO2-supported BC composites have the capability to adsorb, to oxidize and to mineralize organic contaminants under photocatalytic conditions. These distinguished properties of hybrid materials make them one of the most promising materials in the application of wastewater treatment. Although many achievements for the BC-based materials in wastewater treatments have been made, there still remain certain unsolved issues for the preparation of BC-based materials and their applications in environmental pollution management. For example, the total amount of energy consumption for large-scale BCs production is quite huge. A further cut of preparation cost is needed. Meanwhile, the properties of BCs, such as the chemical composition and porous structures, are greatly affected by the biomass types and synthesized conditions. Therefore the precise control of BCs with desired chemical composition and structures is still hard to achieve. On the other hand, most of the literatures mainly focused on the modification technologies with the metal/metallic oxides/hydroxide and other nanomaterials. But it is difficult to accurately control the structures of the hybrid materials at a nanoscale to achieve better performance optimization. Besides, although many studies have demonstrated the excellent performance of BC-based materials in the removal of organic contaminants from aqueous solution, the detailed information about the practical wastewater treatment is still lack. Simultaneously competitive adsorption/catalytical degradation of multiple organic contaminants by BC-based materials should be conducted in future studies. It is also necessary to note that the simultaneous removal of organic and inorganic pollutants from wastewater and also the treatment of BCs and BC-based materials after the preconcentration of different kinds of pollutants are also crucial for their application in wastewater treatment. Finally, the impact of BCs and BC-based materials on the aquatic organisms, such as the biotoxicity, should not be overlooked. The authors thank the financial support from the National Key Research and Development Program of China (2017YFA0207002), the National Natural Science Foundation of China (21836001, 21607042) and the Fundamental Research Funds for the Central Universities (2018ZD11, 2018MS114).